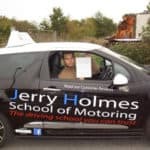 Why choose Jerry Holmes Driving School? Jerry started his driving school back in 2003. He had lots of experience in the driving industry and has taught lots of learner drivers over the years since the driving school has been established and it gave him the knowledge, understanding and skills to pass onto our driving Instructors today. 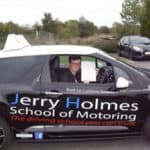 Jerry has attended many training courses over the years as the driving industry has changed many times and there are still ongoing changes with the driving test to make learner drivers safer on the road and deal with the complex road systems. There are 1000’s of motor’s on the road this is why our Instructors are trained to a high standard and that’s one of the many reasons why our driving school is so popular in our local area. 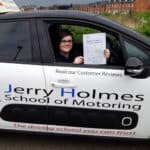 We always put our customers first making sure they have a choice in lessons as some people would like to gain they driving licence in shortest possible time and others like to take their time. This is why we try to be flexible with learning the way you like so that the driving lessons go smoothly and enjoyable to have and not only that if you find that this is not the right choice for you, we will give back any driving lesson that is not used back to you. We think of the customer’s worries or stresses before ours. When you first meet your driving Instructor there is a worry you do not know what to expect on your first driving lesson but there isn’t anything to dwell on as our driving instructors are friendly and trained to expect any situation and to help you overcome any nerves or even if you have any disability that might affect your driving. Our Instructors are trained in these areas and continue to develop their training further, also attending regular courses in coaching and developing skills to a high standard. You and your driving Instructor can arrange a plan of action for your lessons so you will be confident and relaxed in your driving lesson then the Instructor can guide you through the training, giving you the confidence you need. Each driving lesson will be planned out for the next time you meet; you will be more relaxed and excited to do the next driving lesson. Not happy with your previous driving school? 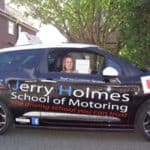 There are many reasons above how some driving instructors conduct their school but here at Jerry Holmes Driving School we strive to give you the best quality customer service like we have done for many years and that’s why lots of local customers are happy with our driving school.